There is so much excitement happening at Shimmerz! I am SO happy to announce the Shimmerz Education Team! 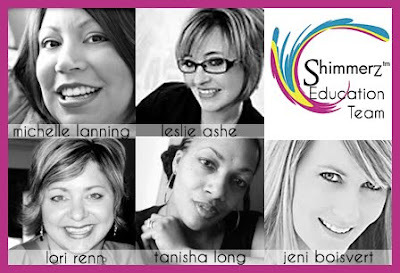 We have put together a fun team of girls that are passionate about teaching and passionate about Shimmerz! It's our goal to teach different and unique techniques using our favorite Shimmering Products, Shimmerz, Blingz, and Spritz!!! I can't wait to see what you all come up with! I know it will be fantastic! Congrats, girls!! Can't wait to watch your videos and see all your amazing creativity!! woot! I'm so excited!!! :D Totally FUN! Congrats girls!!! I'll definitely be watching to see what you guys come up with!! !